San Diego City Council President and former acting mayor Todd Gloria was scheduled to be one of three featured speakers at the June 26 meeting of the predominantly Queer San Diego Democrats for Equality, but he arrived late. “I was attending a commemoration of Latino veterans at the U.S.S. Midway, and that’s not the sort of event you leave early,” he said. 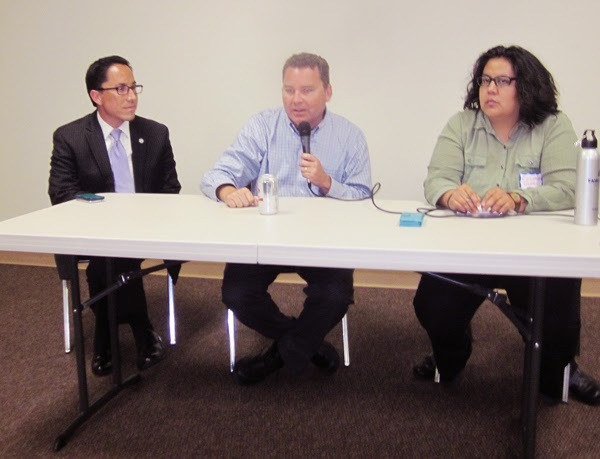 But he joined two other panelists, San Diego Unified School District board member and San Diego-Imperial Counties Central Labor Council secretary-treasurer Richard Barrera and Yes on B and C campaign chair Georgette Gomez, for a lively discussion of what the club called “nullification politics” — in which business interests systematically thwart progressive elected officials by either getting voters to repeal their actions at the ballot box or threatening to do so. The overwhelming defeat of Propositions B and C by the San Diego electorate in June 2014 was the business community’s latest success at “nullification politics.” These measures were put on the ballot by a referendum campaign. Since 1911 California voters have been able not only to pass initiatives, which are entirely new laws written by private citizens and put on the ballot by petitions, they’ve also been able to repeal laws passed by the state legislature or a local county or city government through a similar procedure. A referendum is the same as an initiative — a private individual, organization or coalition circulates a petition to put an issue on the ballot — only it’s designed to get rid of a law previously passed by elected officials, not create a new one. The law San Diego’s business community successfully used the referendum to get rid of in June 2014 was the Barrio Logan community plan. Barrio Logan, a neighborhood created in 1969 when the Coronado bridge was built and its approach road neatly bisected Barrio Logan, hadn’t had a new plan since 1978. According to a presentation Georgette Gomez gave at the Centro Cultural de la Raza April 12, before the election, the intent behind the 1978 plan was to get rid of all the residents of Barrio Logan and turn it into a purely industrial zone. In the 2000’s the city, Barrio Logan neighborhood associations and businesspeople — particularly the owners of the shipyards that are Barrio Logan’s largest industries — began to negotiate a community plan, which the City Council ultimately approved in 2013. “Barrio Logan gave up 95 percent of the plan to the commercial interests,” Gomez told the San Diego Democrats for Equality June 26. But that wasn’t enough for the commercial interests; they were determined to wipe out the plan entirely, no matter how much money they had to spend and how many lies they had to tell about what the plan would do. A local judge actually ruled that the opponents’ referendum petition was being circulated based on blatant lies, including statements that the Barrio Logan plan would cost the city 45,000 jobs and force the U.S. Navy out of town, but refused to rule the issue off the ballot. Once their referendum qualified, they spent over $1 million on a multi-media campaign based on the same lies — and swamped the opposition, winning by a 20-percent margin in a citywide vote. “We only raised $100,000, and most of that came in the last two weeks,” Gomez recalled. The defeat of the Barrio Logan community plan was the latest in a series of triumphs for the business community over San Diego’s elected officials. When the City Council tried to block approval of Walmart’s planned super-stores by requiring “economic impact reports” before the stores could be built, Walmart sponsored a referendum campaign, got enough signatures to put the issue on the ballot, and instead of allowing the election to happen the Council bailed on the issue and repealed the law. The Council did this again when developers challenged an increase in the fees they have to pay the city to fund affordable housing: they repealed the fee increase rather than allow the city to vote on it. It happened again when owners of medical marijuana dispensaries used the referendum to challenge a city ordinance restricting the industry to a handful of dispensaries in out-of-the-way locations — though in that case, Gloria boasted, the elected officials won after all. While serving as acting mayor following Bob Filner’s resignation, Gloria said that since the city’s zoning laws did not specifically allow for any medical marijuana dispensaries, none could legally operate in the city until the Council passed some form of regulation. In a country whose economic system is at least nominally based on private property, this might seem counter-intuitive — Gloria was essentially saying that you can’t do anything with your property unless there’s a city law that specifically allows it — but his argument worked. Gloria boasted that he was able to force the medical marijuana industry to accept “a more restrictive ordinance” than the one they’d tried to challenge by referendum. Richard Barrera’s opening presentation, delivered before Gloria arrived, reviewed the history of San Diego’s business elite’s recent campaigns to use both initiatives and referenda to limit the power of progressive elected officials. “The first major anti-labor use of the initiative process by the business community was Proposition C in 2006,” he said. This was a so-called “managed competition” law that gave private companies the right to bid against city workers to take over city services. Its effect has been mainly to force city departments to lower their costs to win the contracts against private competitors — which, opponents say, has reduced the quality of service and led to longer wait times as the city tries to do more with fewer workers. Next, said Barrera, was the business elite’s attack on so-called Project Labor Agreements (PLA’s) in 2010-2012. Opponents of PLA’s say they cost cities, counties and school board money by forcing private bidders on construction contracts to use union workers and pay union-scale wages. According to Barrera, the idea behind PLA’s is to “get residents of lower-income communities into union apprenticeships” and thereby train local residents for jobs that will help them move up economically. The business community’s campaign against PLA’s started with a 2010 initiative banning them in Chula Vista. Then they persuaded voters in both the city and county of San Diego to bar them in 2012. After that came Proposition B in June 2012 “to eliminate defined-benefit pensions for city employees,” Barrera recalled. It passed overwhelmingly after years of propaganda blaming retired city workers and their allegedly outsized pensions for the city’s financial troubles in the late 1990’s and early 2000’s. Though the municipal workers’ unions had already negotiated contracts with the city to cut back pension expenses, that wasn’t enough either for the business community or the voters. They passed Proposition B despite warnings from local economists that at least in the short term it would increase, not decrease, the city’s pension burden. The bill also imposed a five-year wage freeze on all city workers, on top of the freeze the Council had already imposed five years earlier, thus forcing city employees to go for a decade without a raise. All these clashes between the San Diego City Council and the city’s business community are likely mere warm-ups for the biggest challenge to come: the fight over whether, and by how much, to raise the minimum wage. During the one State of the City address he was able to give as acting mayor, Gloria said this would be a major priority of his during his remaining time on the Council. But he rejected the call of the labor-backed Center on Policy Initiatives (CPI) for a $15 per hour minimum wage, which they estimated was what would be needed to make sure no San Diegans who are working full-time would live in poverty. Instead he initially called for a $13.09 minimum, and since he’s lowered his proposal still further to $11.15. Gloria told the Democrats for Equality that he did this because “I heard from small-business owners that [$13.09] would be too much.” Lowering his proposal to $11.15 “turned a lot of opponents into supporters,” Gloria said, including the franchise owners of Ace Hardware downtown and the UPS Store in North Park. But it didn’t faze San Diego’s largest employers, who — in a tactic typical of big business’s attempts to nullify progressive decisions by elected officials — announced they were going to organize a “Small Business Coalition” to fight any minimum-wage increase in San Diego. “That is not going to be funded by small businesses,” Gloria acidly noted. Answering the objection that a minimum-wage hike in San Diego would lead to fewer jobs and a weaker local economy, Gloria claimed that in other West Coast cities that have raised it — San Francisco, San José and Seattle — the opposite has been true. “San José raised the minimum wage and unemployment went down 2 percent,” he said. “When people’s wages go up, they buy things and this stimulates the economy. Employers complain they can’t afford to pay their workers more because their rents, utilities and health care costs are going up. I tell them these things are all going up for their workers, too. The only things that aren’t going up for workers are their wages.” Gloria said that 200,000 San Diego workers will benefit immediately from a raise in the minimum wage, and in order to avoid a series of fights over what the wage should be, his plan is to tie it to the Consumer Price Index so it automatically goes up with the rate of inflation. Another strategic decision the Council will have to make is whether to pass a minimum-wage ordinance on its own authority or put it on the ballot for the city’s voters to decide. Gloria’s original proposal in his State of the City address was to put it on the ballot, but he’s since had second thoughts. “I was willing to compromise on the wage rate because we need to do it faster,” he told the Democrats for Equality. The club took a straw poll of its members at the meeting — and the overwhelming majority in the room said the Council should raise the minimum wage itself instead of delaying it for a popular vote. It’s likely to end up on the ballot as a referendum anyway, and that will delay it until the election is held, but the club members seemed to think it would be better if the Council passed it first and thereby set the terms of the debate instead of letting the opposition do it for them. The frustration of many club members over the Right’s ability to get things on the ballot and passed in low-turnout local elections led to some suggestions that sounded odd coming from a nominally progressive group. One was to support shopping-mall owners who challenge the right of signature gatherers to circulate petitions on private property. One speaker pointed out that the Uptown District mall, where the meeting was taking place, has signs put up by the mall’s management urging shoppers to drive away petition circulators and canvassers by not signing their petitions or donating to them. Generally progressives have fought for political activists to have access to customers in malls — it’s been a linchpin of the strategy of groups like the Queer-rights organization Canvass for a Cause (CFAC) — but both Gomez and Barrera seemed sympathetic to the idea of trying to keep an anti-minimum wage referendum off the ballot by supporting mall owners in denying access to petition circulators. Other ideas being floated included doing a so-called “decline to sign” campaign, in which supporters of the minimum wage would stand near people circulating the petition and give potential signers reasons not to put their names on it. It’s one of those ideas that progressives have talked about before, but Barrera conceded the progressive community has never mounted “a serious decline-to-sign campaign” against any of the previous pro-corporate initiatives. He liked the idea because, even if the decline-to-sign campaign doesn’t keep the referendum against the minimum wage from getting on the ballot, it would at least start the process of “educating” voters and developing a message to pass the minimum-wage increase. One reform the city has already done, said Gloria, was rewrite the referendum statute so a referendum can go on the ballot in the next regularly scheduled local election. When Walmart qualified their referendum against the city’s attempt to limit them building big-box stores, the law required that a successful referendum petition go before the voters as soon as a special election could be scheduled — which, Gloria recalled, would have cost the cash-strapped city $3 million. By contrast, the Barrio Logan referendum went on a regular city ballot and added only $200,000 to what the city was already spending to hold the normal election. The proposed resolution the club ultimately adopted was a further step in that direction. It was that San Diego follow the example of the state of California and move all referenda and initiatives to the November election in even-numbered years. “The conservatives always want to take the biggest community decisions to the smallest electorates,” Barrera said. “Moving referendum and initiative decisions to November is important because these initiatives and referenda affect mostly people of color, low-income people and young people” — who are likelier to vote in November than in June primaries or special elections. The resolution to call on the city to have all referenda and initiatives voted on in November general elections passed unanimously. The one to set up a “top-two” system for City Council elections similar to the one California uses for statewide offices and the state legislature passed with two votes opposed.